Police investigating attacks against cash machines throughout Yorkshire and Durham have arrested four people. 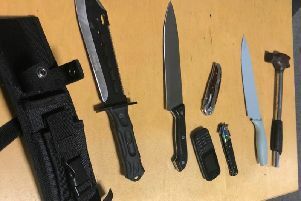 Officers arrested the three men and one woman on Wednesday during a series of raids in the Bradford, Darlington and Middlesbrough areas. A series of cash machine attacks were carried out across the Yorkshire and Durham regions. Cash machines were targeted across both regions between October 26, 2017 and February 14 this year. More than £300,000 was stolen, while thousands of pounds worth of damage was caused to nearby buildings and businesses. Detective Inspector Lee Fletcher, of the Yorkshire and Humber Regional Organised Crime Unit, said: “Cash machines can be a vital local resource to people – especially in more rural areas. People can rely on them as a nearby supply of available cash. “Increasingly dangerous tactics are being used by some criminals who are trying to take ATMs. We are working closely with police forces, local communities and the ATM industry to prevent and detect such offences. The three men questioned by police were a 34-year-old arrested in Bradford, a 34-year-old arrested in Darlington and a 45-year-old arrested in Middlesbrough. They were arrested on suspicion of conspiracy to cause an explosion, conspiracy to commit burglary, conspiracy to commit theft and conspiracy to enter into or be concerned in the acquisition, retention, use or control of criminal property. A 45-year-old woman was arrested in Middlesbrough on suspicion of conspiracy to enter into or be concerned in the acquisition, retention, use or control of criminal property. Vehicles and cash were also seized during the operation. All of those arrested have been released under investigation, police said.